A Kwa family tree, showing some family members and their titles / positions. Links with verification and additional info below. Thanks to several diligent netizens for contributing to this post. Kwa Geok Choo (“Mrs. LKY”) was married to Lee Kuan Yew for 63 years. Kwa was the co-founder of Lee and Lee law firm. She participated in drafting the PAP party’s constitution and gave a speech on radio urging women to vote for the PAP in the upcoming elections. 1. Kwa Kim Li is a niece of Kwa Geok Choo. Kwa Kim Li is a director at Mapletree Commercial Trust (a GLC and unit of Singapore sovereign wealth fund Temasek Holdings Pte. Ltd.’s property arm, Mapletree Investments). 2. 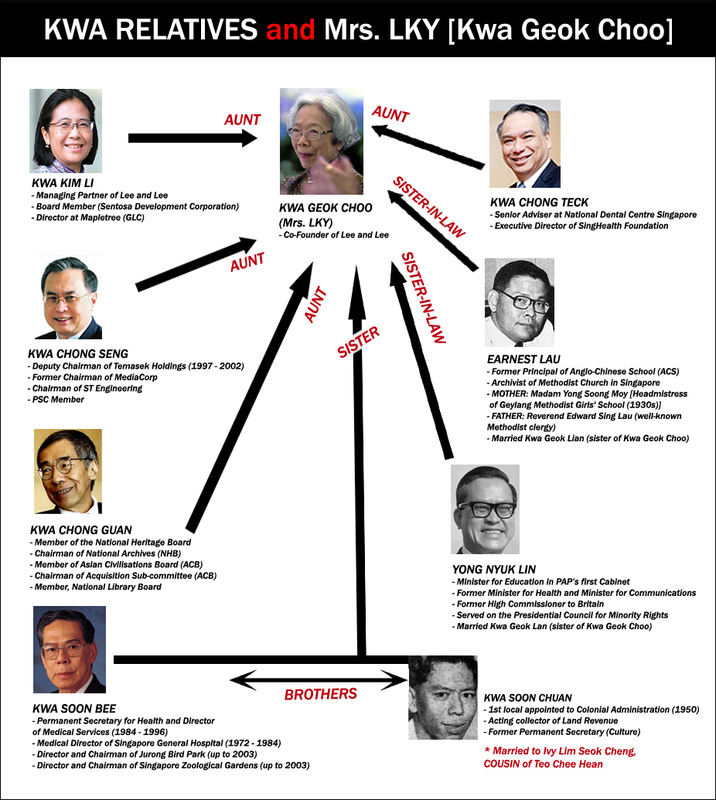 Kwa Chong Seng, Public Service Commission (PSC) Member and former Temasek Holdings chairman, is a nephew of Kwa Geok Choo. The Public Service Commission (PSC) is constituted under Part IX of the Constitution of Singapore and its constitutional role is to appoint, confirm, promote, transfer, dismiss and exercise disciplinary control over public officers in Singapore. The PSC also retains two key non-constitutional roles. It considers the suitability of candidates for appointment as Chief Executive Officers of Statutory Boards; it is also responsible for the planning and administration of scholarships provided by the Government of Singapore. 3. Kwa Chong Guan, chairman of the National Archives, is a nephew of Kwa Geok Choo. Read more about his influential titles at the end of this post on the National Heritage Board. 4. Kwa Soon Bee, former Permanent Secretary for Health and Director of Medical Services, is a brother of Kwa Geok Choo. 5. Kwa Soon Chuan was the first local appointed to the Colonial Administration. He is a brother of Kwa Geok Choo. 6. Yong Nyuk Lin, Minister for Education in PAP’s first cabinet, is a brother-in-law of Kwa Geok Choo. 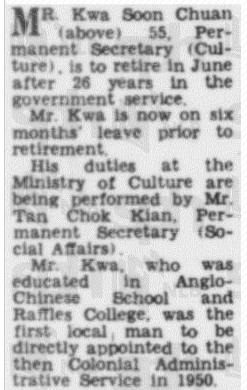 His spouse is Kwa Geok Lan, elder sister of Kwa Geok Choo (Mrs. LKY). 7. Earnest Lau was the principal of ACS. His mother was Madam Yong Soong Moy, Headmistress of Geylang Methodist Girls’ School (1930s), and his father was Reverend Edward Sing Lau (Ee Sing), Pastor of Telok Ayer Chinese Methodist Church (1929-1930), Geylang English Methodist Church (1930-1951) and Straits Chinese Methodist Church (1952-1963). Earnest Lau’s spouse is Kwa Geok Lian, sister of Kwa Geok Choo. 8. According to a couple of thorough online comments, Kwa Chong Teck, Senior Advisor at National Dental Centre Singapore, is the brother of Kwa Chong Seng. This blog post takes a look at Kwa Geok Choo (the “Dragon Lady”) through the perspective of Peranakan culture. them…….My mother knew the Laus well…so I KNOW !